The lantern roof market is a relatively clustered one, which has enjoyed considerable growth in recent years. With various companies offering their own unique designs, it can be difficult to decide which option is best suited to meet customer requirements. We at Astraseal Trade supply Stratus roof lanterns, which we believe stand out above the rest. Here’s what makes them perfect for any home. Stratus roof lanterns are fitted with 24mm glazing and utilise an innovative thermally broken system, allowing them to perform up to 65% more efficiently than traditional aluminium systems. Improving the energy efficiency of their home has become increasingly important to homeowners in recent years and could add considerable value to their properties. With one of the most energy efficient lantern roof systems on the market available, you can offer a product more likely to appeal to a wider range of customers. Designed to allow for speedy, straightforward installations, installers are able to spend less time on site. This means the disruption to your customer’s lives is minimised. They feature a ridge that is 66% smaller than standard systems and a 20° pitch which allows purpose designed cappings to be used. This ensures for incredibly slender sightlines, meaning more light is able to make its way inside than competing systems. This emphasis on minimalism also results in a clean, sharply defined appearance that is incredibly appealing visually. Contemporary – this type of design features a ridge that is only supported by the hip rafters, ensuring for a minimalist appearance. Suitable for new projects or as a replacement for existing lantern roofs, they’re constructed from incredibly robust aluminium, ensuring they’re built to stand the test of time. 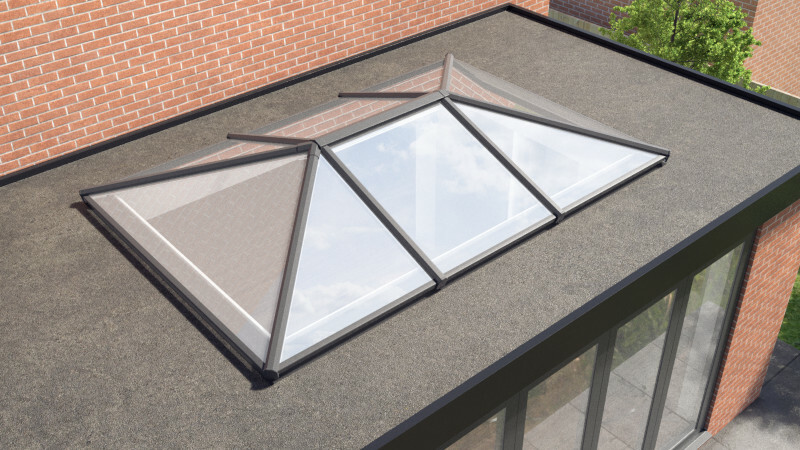 Astraseal Trade manufacture all our Stratus lantern roofs in-house, allowing us to offer installers considerable savings and quick lead times. For more information, call 01933 227 233 or contact us online.